Pinacothèque: The Birth of a Museum - LAST DAYS!! The Birth of a Museum is not one exhibition, there are actually two. Or to be precise: three. That might sound confusing, but don’t worry, I’ll sort that out for you. The Pinacotthèque of Paris – a private structure opened in 2007 - has just unveiled its new 3000 square meter exhibition space close to Place de la Madeleine with two exhibitions and the inauguration of its permanent collection. First, there is The Romanovs, Tsars and Art Collectors with masterpieces like Rembrandt and Titian on display. Secondly, there is The Esterházys, Princes and Art Collectors showing the collection of the noble Hungarian family, whose roots go back to the Middle Ages. That makes two exhibitions around one topic: how a simple collection can grow into a true museum. Finally there is the permanent exhibition with a similar subject. Here you can see how parts of different collections can merge to form a new museum. The new Pinacothèque is actually conceived like a cabinet of curiosities, a real Wunderkammer, mixing schools, styles and periods deliberately. Let’s start with the Romanovs on the ground floor: 99 paintings of the Petersburg State Hermitage Museum, magnificent pieces like a Rembrandt, a self portrait of Veronese, Velázquez, Titian, you name it. There are some less impressive works, but this doesn’t matter. Here it’s all about the making of a museum, the Hermitage, that opened its doors 1852 to the Petersburg public. It was Peter the Great who started the collection at the end of the 17th century. He was deeply curious and apparently he had enough money in his war chest to buy a Rembrandt. 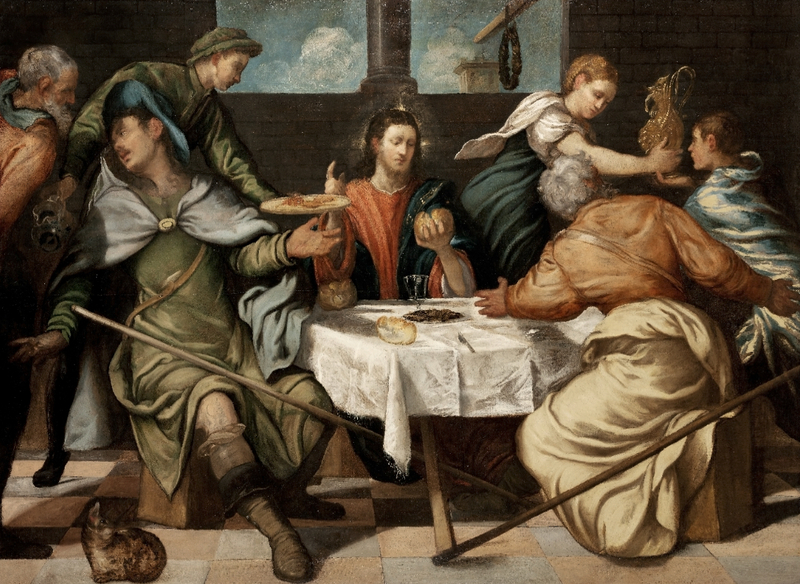 A great admirer of Dutch art, Peter the Great also acquired other biblical subjects on the Amsterdam market. Rembrandt’s David and Jonathan is the most impressive. Not only because of its beauty. It tells the Old Testament story of King Saul who wants to kill his son’s best friend David because he’s convinced that the latter wants his kingdom. But his son Jonathan warns his friend David about his father’s attempts to kill him. 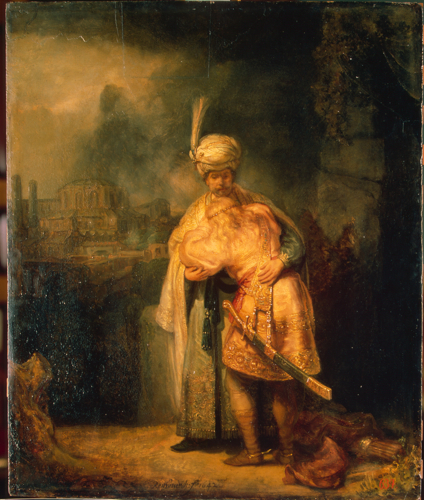 Rembrandt shows the two men with David desperately crying in the arms of his friend. The subject must somehow seemed familiar to Peter the Great who killed his eldest son Alexei because he had disobeyed him and opposed official policies. After the murder of her husband Peter III, came Catherine II. She wasn’t the kind of girl to make shoe collections. She was an enlightened ruler, exchanged letters with Diderot and Grimm and travelled to Paris to buy paintings. Her greatest scoop was the purchase of the collection made by the banker and patron Pierre Crozat: a Rubens, two Poussins, van Dyck. At her death in 1796 the gallery included over 4000 paintings. Alexander the First and Nicolas the First completed the collection and following the fire of the Winter Palace in 1837 the latter made build the New Hermitage. A museum was born. A modern museum like the Louvre in Paris and the British Museum in London. 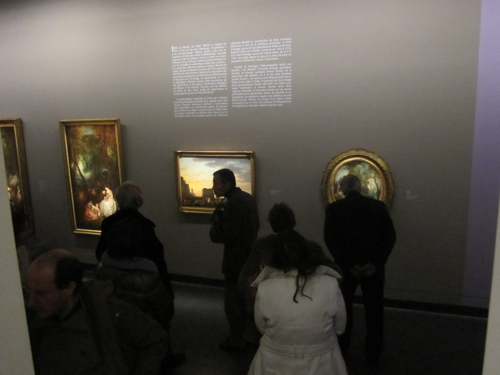 Let’s have a look now at the Esterhazy exhibition situated in the basement. Same benchmarks: collection started in the 17th century. 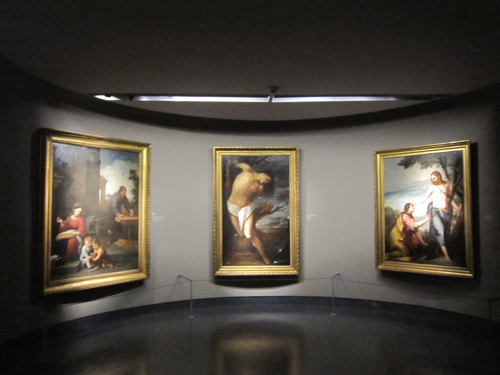 At the end, when Nicolas II died in 1833, the collection contained 1156 paintings. 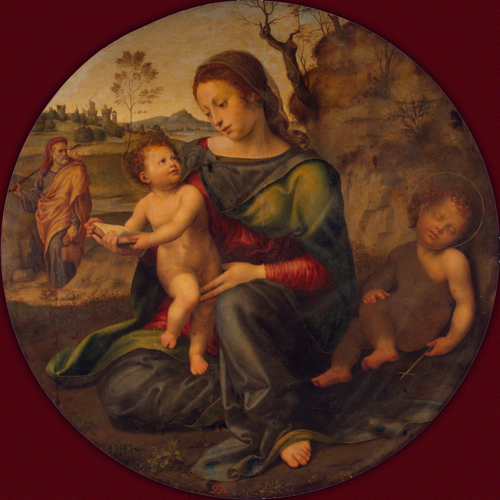 And not the minors: Raphael’s Madonna and the Child with Infant St. John, his Portrait of a young man, Tintoretto’s The Emmaus Pilgrims, Lucas Cranach’s The lamentation of the Dead Christ, a portrait of Frans Hals. From the very start, Nicolas II organized his collection according to Schools. The layout of the exhibition therefore takes account of this initial decision. That makes the difference between the Esterhazy and the Romanov collection: whereas the latter is shown by periods in which the paintings have been purchased, the Esterhazy collection is displayed according to Schools. By the way: it was only in 1879 that the collection was sold to the Hungarian State. 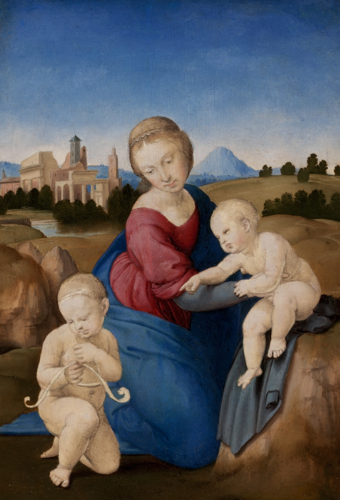 It then became the core of the collection of the Fine-Arts museum in Budapest. By presenting these two shows together, the Pinacothèque wishes to retrace the history of taste in the European elites at the start of the 19th century. Are these two exhibitions therefore an absolute must? I wouldn’t say so. The new Pinacothèque is crowded: too many people and too many paintings. It’s of course hard to make a more restricted choice. But it’s not necessarily for the good of the exhibition – or the good of the visitors. Still, there’s a lot to see if you prepare yours visit. Decide before coming which masterpieces you want to study and forget about the rest. Or just catch an audio guide. It’s for free.